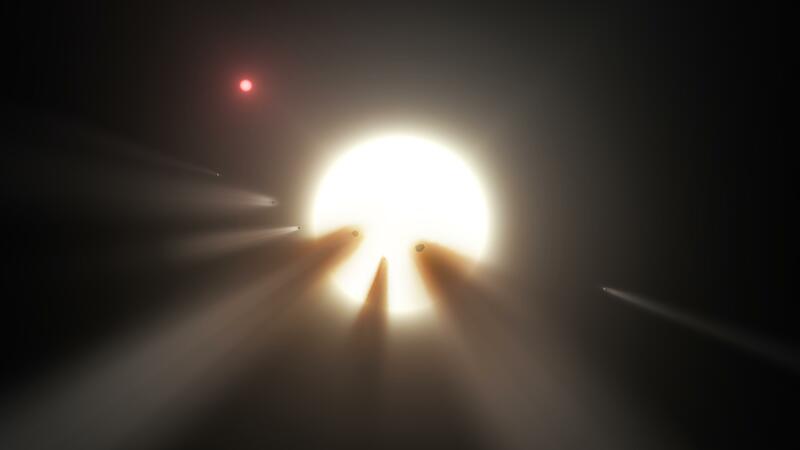 The debate about the "alien megastructure star" continues to rage. Last fall, an unassuming star called KIC 8462852 became a hot topic among astronomers and astronomy fans after the planet-hunting Kepler telescope showed unusual light fluctuations in the area. At the time, the strange changes in the light patterns were believed to be caused by either asteroids or planets; however, some suggested that the changes in light may be caused by alien megastructures revolving around the star (no, seriously). The debated fluctuations show that something, which did not register any heat emission, is blocking 20% of the star’s light, prompting many scientists to speculate that an alien civilization may have been surrounding the star with something like a Dyson sphere. It was an unlikely hypothesis, but remember, science is about investigating all avenues (even the most unlikely). To that end, SETI pointed their telescopes at the star to try and find evidence of aliens. They didn’t. In fact, studies pointed out that there is no credible evidence that Tabby’s Star has been steadily changing at all. But this new research has made some start questioning again. In a paper posted to arXiv, Caltech astronomer Ben Montet and Joshua Simon of the Carnegie Institute revealed that the star has been getting dimmer over the course of four years. The pair conducted an exhaustive photometric analysis of the data collected by Kepler during the four years of its campaign. They found that, yes, the huge dips that left many scientists baffled are there in the original data, but more importantly, the star’s total light output has been dropping—dramatically—overtime. For the first 1,000 days, Montet said Tabby’s Star’s luminosity declined by about 0.34% per year. But over the next 200 days, the star dimmed by 2% before leveling off. A total drop of 3% in a four-year period is incredibly bizarre, especially since the astronomers also looked at 500 other stars near Tabby Star, but saw none of the behaved in a similar way.